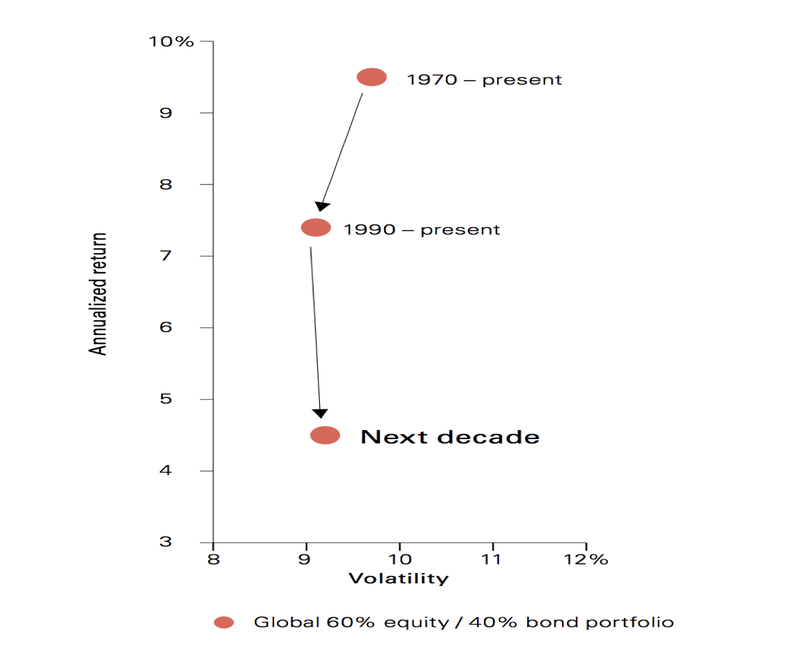 With increasing volatility of investment portfolios it is now important to review the risks of a retirement portfolio. 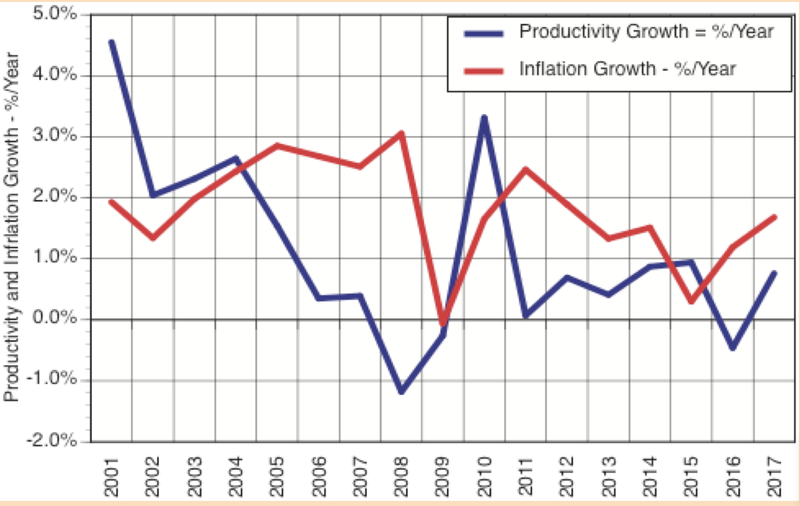 There is a possibility that a precipitous recession may arrive. Portfolios that hitherto have enjoyed large gains are now faced with slower growth as well as smaller yields. 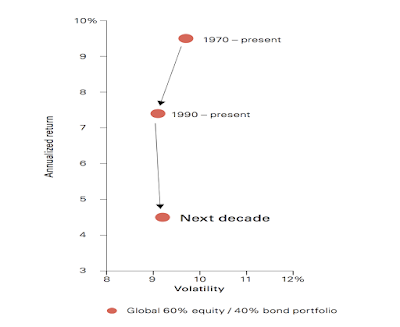 The current financial prospects suggest that the high annual returns from the stock market during the 1970s - with typical holdings of 60% of equities and 40% bonds - are expected to decline to less than 5% returns in the next decade. As inflation is likely to rise to 4-5% in the future, what should a retiree do to increase assets. A recession can decrease retirement holdings by as much as 50%, That increases the urgency for acting now instead of delaying in hope that the stock market may continue increasing for yet another few weeks. 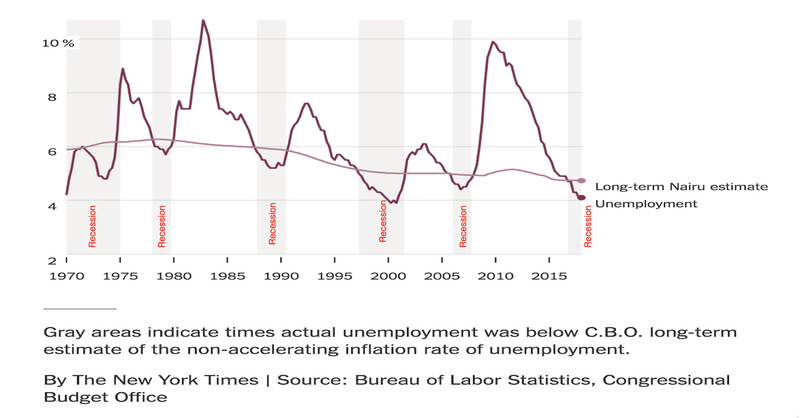 There is a consistent pattern showing that the federal funds rate declines until a recession takes place. 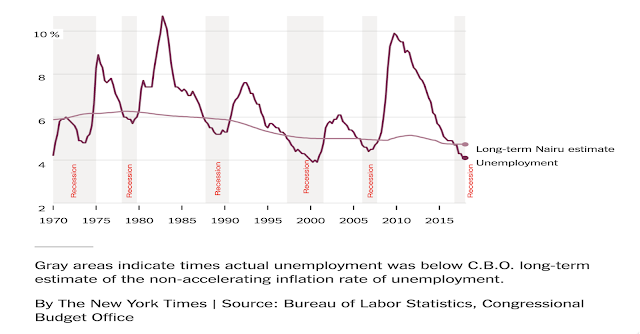 The current pattern (2017-2018) is consistent with the past except that in the current case the Federal Reserve has run out of more reductions of interest rates. The present cases of decline and recovery may not re-occur. A new recession may be more severe than ever before. The increase in margin debt reflects not only low short-term interest but also a concentration of wealth in the top half percent of the investors. As the supporting economy - as measured by deflated levels of GNP and declining real (deflated) average income - the stock market keeps delivering exceptional gains to large holders of capital. 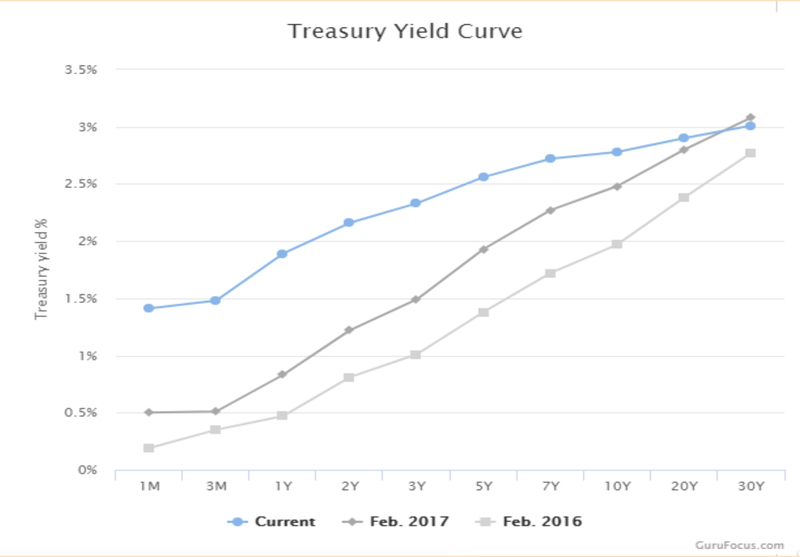 These yield curves shows a "flattening", with short term rates rising towards long term rates. This suggests that a large amounts of cash is available for trading, to pay for dividends, to re-purchase shares or to pay for corporate mergers. That makes the market rise even if the underlying economy is not performing well. Instead of investing capital in long-terms gains from innovation the current profits from short term (e.g. 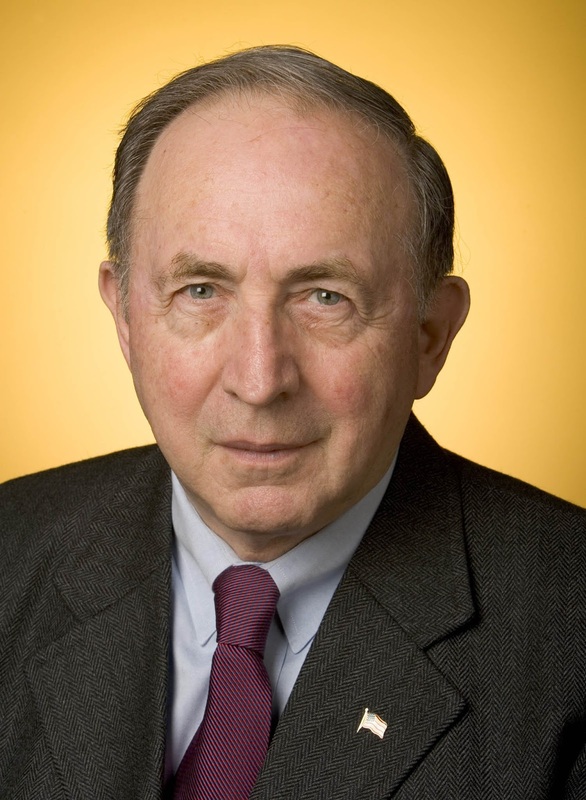 lower yield investments) remain meanwhile attractive to boost quarterly financial results. 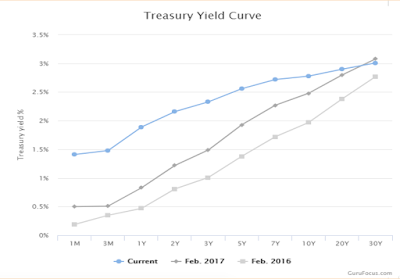 This cyclical pattern is unique in that it actually anticipates a new recession by about half a year after the interest rate spread passes zero. In this way one can pre-date the occurrence of a recession, or to say that the canary dies before the investors experience the next crash in the stock market. It is now apparent that the next recession now overdue and will most likely occur in 2018. Does our review concern long-term trends? So far we have dealt only with cyclical occurrences. Is it possible that a the US economy may be subject to only short-term ups and downs and always recovering to higher peaks at greater levels of prosperity? In this regard I accept the theories recently proposed by Ray Dalio who is the head of one of the largest hedge funds. When the economy of the USA is examined one should not pay attention only to the stock market. What matters is the fundamental earning capacity of the underlying economy. Government statistics, such as GNP cannot be completely trusted because they are subject to political bias. 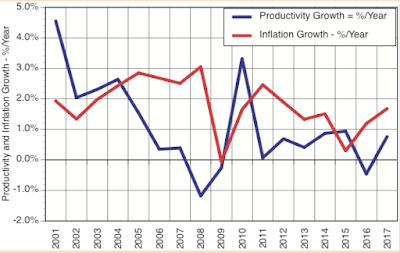 These charts (1) show that at least since 2001 US growth in productivity was below levels of inflation. The underlying US economy is not likely to produce future gains that would support growth in the valuation of its financial capital. We conclude that a retirement portfolio will have to last 20 to 30 years under conditions of rising inflation. Unless assets are already in place the average retirees may have to look for better returns internationally for a part of their retirement savings when rebalancing their portfolios.